Next bout is a flyweight title fight. Round 1: Sporting a decent height and reach advantage, Rizzo's strategy is clear: pick Grant off from a distance. Grant counters with a takedown, the scramble furiously, and Grant ends up first with a guillotine attempt and then is in Rizzo's guard. Rizzo gets back to his feet, steps in to do something, and BAM! Grant blasts him with an uppercut that has the taller guy KO'd. That's all she wrote. Grant is now the flyweight champ. Result: Jimmy Grant def. Matt Rizzo via KO (Punch) in R1. A lightweight title bout is next. Round 1: This one is a hugely anticipated fight between two top guys, and the crowd makes their happiness known. The first minute and a half is spent in kickboxing mode with neither man really taking the lead. But at the two-minute mark Perez catches a leg, spins to Wade's back and tries to gain control. Wade keeps his cool and shakes him off, and then goes to work from within the Ricardo Almeida-trained fighter's guard. Perez threatens with an armbar, Wade counters with ground and pound and a neck crank, and the clock runs out with Wade likely taking the round because he was on top. Round 2: More kickboxing in the opening 30 seconds, and then Wade throws his foe down and is again trying to inflict damage while dodging subs. Perez utilizes his butterfly guard to create enough space to wall-walk to his feet, and it's his turn to work for a takedown. There's a brief break in the action after Perez punches Wade's mouthpiece out, and then suddenly Wade has got an ultra-tight guillotine going and Perez is rolling to defend. The round ends with Wade in Perez's guard. Round 3: Perez looks to be the fresher of the two, and he shows it by landing kicks and backing Wade up. After a minute and a half they're clinched up against the fence, and after a separation, Perez feeds the Long Island MMA rep a right hand and a knee to the junk. Referee Gaspar Oliver gives Wade time to recover, and when they restart Perez lands another hard kick to the body that has Wade hunting for the clinch and takedown. Success eludes him though, and Perez is sprawled and landing knees to the body while the crowd cheers. Back up and Wade plants a sidekick to Perez's body that makes him back up, and the round ends with Wade on the ground going for a Hail Mary guillotine. Result: Chris Wade def. Frankie Perez via Split Decision. Last bout and it's a heavyweight title fight. Round 1: The feeling-out process lasts about two seconds, and then they winging bolos. Neither man tags the other flush though, and at just about the halfway mark Barrett gets the ankle pick, steps into mount, and drops fists. Woods turtles, Barrett continues punishing him, and the challenger scrambles back to his feet. Barrett gets him down once more, and for the rest of the round he feeds Woods knuckles, even after Woods gets up and presses him against the cage. Round 2: Woods comes out breathing heavy, while Barrett seems to have a bit more pep. They trade punches for a bit, and Barrett again has his foe down and is battering him. Woods has enough energy to attempt one roll-out escape, but it's for naught, and with the challenger lying flat on his stomach and the champ pounding away, referee Liam Kerrigan steps in. Result: Brendan Barrett def. 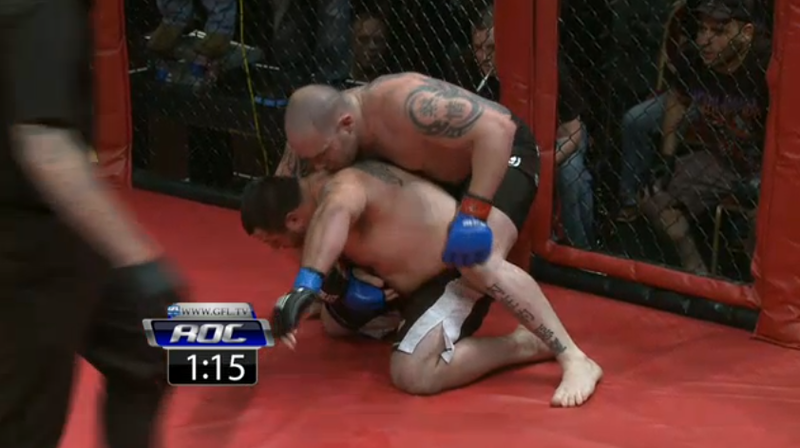 Justin Woods via TKO (Punches) at 1:59, R2. My review of the GoFightLive broadcast: Awesome. I highly recommend it.